Food – the part of the economy that encompasses the production, the processing and the marketing of foods – is big business. In fact, the successes of the food industry depend in no small measure on the use of statistics. For example, the scientists in a food company need to understand and measure the sensory quality of foods. They want you to spend more and eat more. One of the ways to do that is to produce the food products that tickle and entice as many of the senses as possible. Two short courses (one-day and two-day) offered by the Food Science Department at Rutgers University give some clues on the statistics used in food science. Here’s the link to the short courses (statistics and sensory evaluation). Just in case the links are broken or removed in the future, here’s the screen shots for the course descriptions. 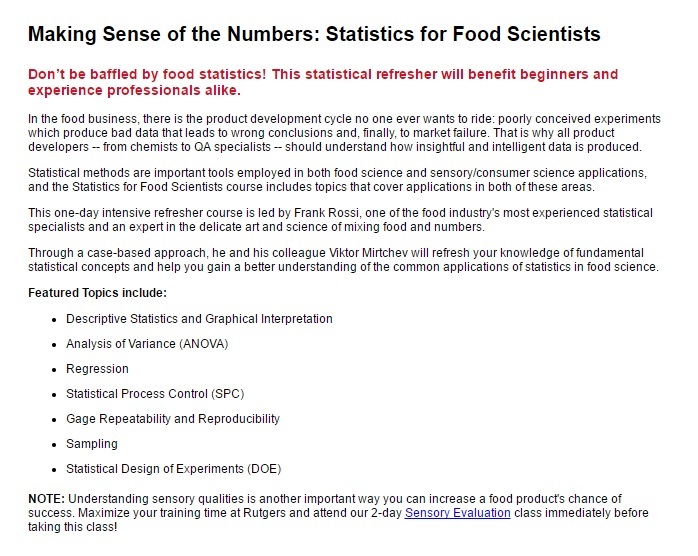 The above screen shot is the description of a statistics course called Statistics for Food Science. The topics are basic statistics topics that are applicable in many disciplines and industries. It is clear that the course will be tailored to the food industry. The broad goal of the course is to help scientists and specialists in the food industry to properly design and carry out experiments and to make sense of the data produced in the experiments and other studies. There are 7 bullet points for the subjects/topics discussed in the course. All of them are useful topics. In fact, some of these topics are even touched on in some level in an introductory stats course. For example, the first bullet point is on descriptive statistics – using numerical measures and graphical summaries to make sense of data. An introductory course touches on regression and sampling distribution theory (at least superficially). For example, simple regression (one explanatory variable and one response variable) and one-variable sampling theory involving normal distribution are covered in an introductory stats course. Basic concepts in experimental design are covered too in an introductory course. So all the topics listed are important and useful. But it is not clear how they can covered these many topics in a meaningful way in one day (the course goes from 8:30 AM to 4:30 PM). But clearly, these statistical concepts are useful for the food industry. Presumably the fees for the attendees are paid for by their employers. In any case, this short course demonstrates the importance of statistics in the food industry. More importantly, it demonstrate to anyone taking an introductory stats course that what they are learning in class can open up a world of new ideas and opportunities. 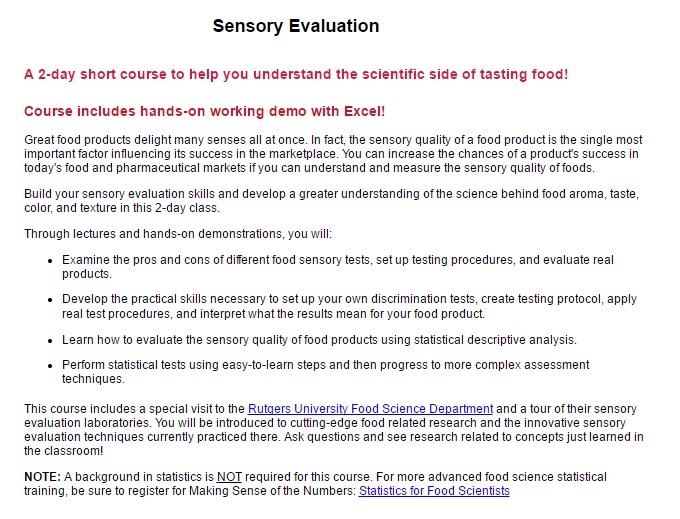 Here’s the description of the course on sensory evaluation. This course is a hands-on course. The goal is to develop a greater understanding of the science behind food aroma, taste, color and texture, in other words, ways to make food products more enticing and appealing. The 4 bullets points list out the key objectives – learning about different tests that can be used and developing practical skills on setting up and running discrimination tests. Descriptive statistics (third bullet) is a bog topic – analyzing the data that are produced from the tests and experiments. We are not endorsing the courses by any means. These courses provide a vivid example of applications in statistics, in this instance in food science. This post is a plug on statistics and not necessarily a plug on the entity that gives the courses. This entry was posted in Commentary, Statistics In Action and tagged Descriptive statistics, Introduction to statistics, Introductory statistics. Bookmark the permalink.